Small businesses work hard to achieve success. But as sales rise and customer bases grow, startups often find they need a new place to do business — either a new office or significant expansion of a current location. A new space or expanded operation needs an IT infrastructure to support it, including networks, data centers and the power to run them. Consider fast-growing law firm Tucker Ellis, which is home to more than 200 lawyers in seven offices across the country. CIO Scott Rolf has overseen more than a dozen office migrations and expansions. This year, the firm added three offices in four months — a Houston office in March, a Chicago office in May and a St. Louis office in June. Such growth creates significant IT challenges, Rolf says. But it also presents valuable opportunities. It’s a time to reassess old habits, shed aging IT infrastructure and align the business with cutting-edge solutions that can pave the way for even further growth. As businesses grow, they need networks sophisticated and robust enough to support increasing users and applications. Small outfits that have been getting by with simple spoke-and-hub topologies and consumer-grade routers and switches should consider whether they need to upgrade as part of a move, says John Guzejko, a networking solution architect with CDW. Too often, he says, small businesses lack the dedicated IT teams to handle a network overhaul. “Companies that make this transition end up far more accomplished from an IT perspective,” Guzejko says. Wireless networks pose a special challenge. Organizations may need to serve hundreds of users scattered over thousands of square feet, roaming among dozens of access points. Symptoms of a struggling network — dropped connections, sluggish response times and stubbornly slow page loads — often emerge even before an expansion. Predictive survey: The IT team will estimate the number and location of access points and cable drops based on a review of floor plans and the expected location and number of users. Site survey: IT staff members inspect the physical space, using a portable Wi-Fi signal scanning tool to detect interference factors that impair reception. They then use the information to optimize AP placement and configuration. Networks should be structured for redundancy, security and performance, replacing simple hub-to-endpoint cable runs with multitier layouts. Updated cabling: An organization will want to replace copper Ethernet cable with copper CAT 6 or CAT 6a cable that can support data rates of up to 10 gigabits per second. Further, installing redundant cable can protect against failure and provide for increased capacity if needed. Enhanced electrical: IT leaders will want to think about power at every step of an expansion. A survey of the existing electrical service and wiring can determine what must be done to fulfill business requirements. Power over Ethernet (PoE) network hardware and clients reduce the need for electrical cabling and can offer more flexibility in a network layout. 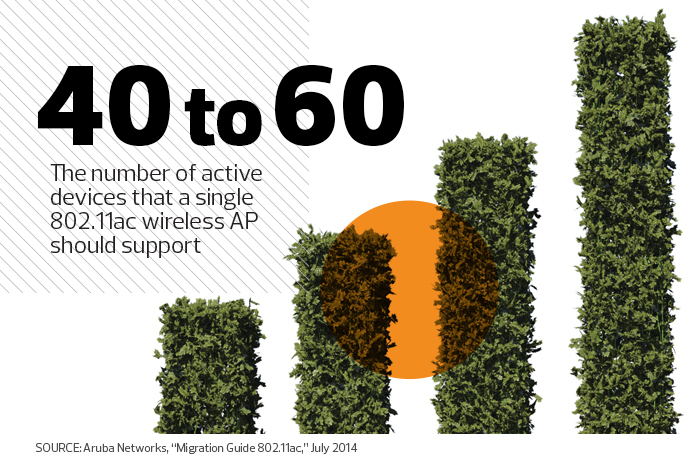 Energy efficiency: New 802.11ac Wave 2 network hardware is fully compatible with older Wi-Fi equipment and can reduce the power drain on 802.11ac-compatible devices. Virtual LANs: VLAN segmentation can isolate network traffic and enable quality-of-service support for Voice over IP, video and other latency-vulnerable communications. Managed switches: Intelligent Layer-3 switching hardware provides visibility into traffic and lets IT staff shape, filter and prioritize data flows. Tucker Ellis’s Rolf says power should be a priority in any move or expansion. He recommends assessing the character, quality and location of electrical service throughout a new space. First, verify the inbound electrical serv­ice and the quality of wiring in the spaces intended for use. Next, review circuits to determine if they are sound (some may be shared across rooms and floors, and even with other tenants). Then, make sure to run adequate power to switch closets and other aggregation points. Finally, deploy universal power supplies and more sophisticated power switching hardware as needed to ­support uptime targets. If a business adopts PoE-based switches and network gear, that eliminates the need for dedicated electrical outlets and power bricks for networked devices such as Wi-Fi access points, VoIP handsets and security cameras. But a PoE rollout increases both electrical and thermal loads in a wiring closet. This creates a corresponding growth in the need for cooling. Power and cooling resources must be carefully deployed to account for current needs and future growth. By pairing rack-mounted servers and storage with efficient power distribution units (PDUs), data center managers can optimize floor layouts for air flow, cooling and access. A growing data center also may benefit from adoption of a data center infrastructure management solution to monitor, measure and manage activities. DCIM solutions address both IT-related equipment (servers, storage and switches) and facility infrastructure elements (PDUs and computer room air conditioners). The goal: Unify IT and facilities management activities into a single environment. Even with the best of plans, Rolf warns that growing businesses will likely run across more than a few surprises. To manage surprises, Rolf develops detailed migration checklists. A checklist can’t forestall every hiccup, but it does minimize them. Be alert to ­mundane — yet important — factors such as parking availability, freight elevator access and security system configuration. The 802.11ac wireless networking specification significantly improves on the previous 802.11n standard — delivering enhancements in maximum data rates as much as 15 times the previous maximum — while enabling a host of features that boost responsiveness and reliability. Products released as 802.11ac Wave 1 are widely available, while more capable Wave 2 products are emerging now. Beamforming: By shaping the Wi-Fi signal so it is focused toward connected clients, beamforming improves data rates and extends reach. Modulation: Beamforming also improves signal modulation, embedding more bits of information in each waveform and yielding up to a one-third increase in network throughput over 802.11n. Spatial streams: Multiple input, multiple output (MIMO) capability has been doubled to support up to eight spatial streams for sending data in parallel to clients. Multiuser MIMO: Available only in Wave 2 products, multiuser MIMO allows an AP to transmit to as many as four clients simultaneously.